Just like in most Brownie units, our 90-minute meetings are pretty packed! We have circle time to discuss the theme of the night, then we do an activity, games, crafts, and wrap things up with our closing. Some girls thrive on this structure; others have to be coaxed from one thing to the next, lingering over the last details of their craft or needing a specific personal invitation to join our circle after running around. This week, our meeting was different – very different! Here’s some background. Usually, as a reward for cookie selling near the end of the year, we take the girls to a fun activity (last year we went trampolining) that costs a bit more than we would usually spend. This year, during a discussion about how children in many countries are affected by diseases that we in Canada don’t have to worry about, the girls came to the conclusion that they would like to donate the money we usually spend on this fun night out to the World Thinking Day Fund. We discussed things we could do in our usual meeting space that would be free (or close to free) and fun, and they came up with a fake sleepover. They would dress in their PJs, bring sleeping bags, eat not-good-for-them food, dance and play games. So, last week, we had this fake sleepover night, and it was so much fun! Us leaders treated them to pizza, Brown Owl brought a bag full of nail polish from her own collection (every colour under the sun! ), and we made friendship bracelets with beads leftover from another craft. They danced to Katy Perry music on an iPod, and ran around the gym with no agenda at all – it was complete chaos, and it was wonderful! At the start of the night, we told them they could do whatever they wanted – participate in the planned activities or not, make their own games, talk while laying on their sleeping bags, anything! Some of them started off feeling a bit apprehensive over this freedom (one girl exclaimed, “You mean, we have no control over ourselves? !”, which made me laugh out loud), but they really got into the free-play spirit. Those who like to sit and contemplate things spent most of the night crafting their bracelets with great care. Those who love to run made up games and played until they were panting. Those who like to talk chatted away; no one complained about anything! We noticed this unstructured-play effect at a district camp a number of years ago, when the kids were not given any downtime to play in their tents. They became whiny and over stimulated. The next year, running our own camp, we actually let them have as much free time to play after lunch as they wanted. They made up an entire world involving their tents, and we got to enjoy some camp-stove coffee while they played! It seems that there is real value to what could be seen as chaos. The girls left the meeting chatting happily with each other about what they had done that night, and we didn’t even play any structured games. While most meetings won’t be this “disorganized,” I think we might all benefit from a little more unstructured time now and then. By guest blogger Guider Kristy Martin (Tawny Owl), 25th Ottawa Brownies. Kristy has been working with the 25th Ottawa Brownies for six years. She works for a company that creates educational websites and games for cultural institutions, and loves to extend this into writing stories, plays and planning interactive activities for her unit. Read her previous post on GirlGuidesCANBlog: Seasonal Party Idea, This Guider Asks, and Guides and Scouts: Awesome in their Own Ways. 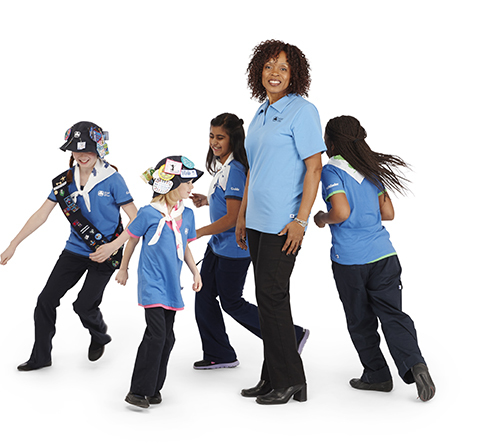 What’s new with Girl Guides? 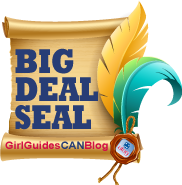 This Monday, May 27, we are launching our second annual GirlGuidesofCAN Big Deal Seal! This special award recognizes and celebrates the contributions made by our bloggers (May 1, 2012 – April 30, 2013). Watch for Monday’s blog post with complete details and on how to vote for your favourite post! This entry was posted in Awesome Activities and tagged brownie, meeting ideas, sleepover. Bookmark the permalink. This is a wonderful Blog – the girls are so generous to put others first. This is great. There is some value to having a non-planned night every now and then, especially during this wind-down part of the year. I always find that the girls are high energy and they find it difficult to concentrate this time of year. There has been many nights when we have had planned and then decided to go outside and let them run and play on the playground. At a recent sleepover where the plan was to cook and bake the whole day through, we found they needed the breaks between stints and let them go at it. They created forts from the sleeping bags and the chairs, they kept going back to them. By the end of the day (when they had to come down) the older ones had started ‘inspecting’ their forts 🙂 After clean up they played silent everybody’s it tag, the quietest half hour we’d ever had, and they thought it up!